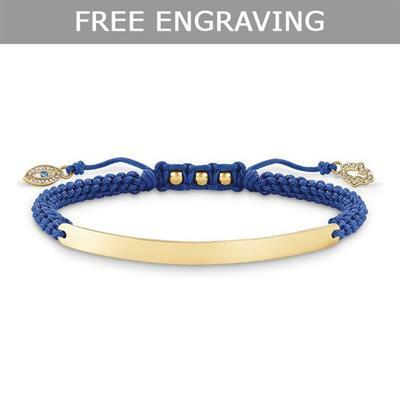 This striking bracelet by Thomas Sabo is part of the engravable Love Bridge collection. This dark blue hand-knotted macram bracelet features a Hand of Fatima and a Nazar's Eye crafted from 925 Sterling silver with 18ct Gold Plating and White Zirconia Pav. This bracelet adds a fun pop of colour to any ensemble, and the knot motifs makes this the perfect personal gift with a boho twist. This bracelet is 21cm in length.